Our Delayed Harvest (DH) season is here! Nothing better than heading up to the mountains with some friends and hitting the water. Most of our DH waters are marginal at best but it serves as a two-way street for many anglers. First, during the cool temperature months like November into May, trout will survive in these streams. On the other hand, from say late June until late September, trout will more than likely not survive the warmer water. The cool thing about this is the win-win situation for fall/winter time anglers with catch and release fishing, and those who want to harvest fish before the warmer water periods of summer. It’s the best of both worlds for all anglers who use these types of waters! Georgia’s DH season begins November 1st, and continues through May 14th. The DH sections of these waters are marked with signage. During the DH season, anglers must release all trout immediately, and use and possess only artificial lures with one single hook per lure. This means no nature bait, no scented bait, and no treble hooks as used on many spinning lures. *See the Georgia Fishing Regulation for complete information about these waters and their rules. Georgia has only five waters listed in their DH program. They are Amicalola Creek, Chattahoochee River, Chattooga River, Smith Creek and the Toccoa River. These waters are stocked heavily with trout and some larger trout are added as well. Just up the road, North Carolina has over 30 streams listed in their DH program. I hope that one day in the near future, Georgia will add some additional streams to their DH program. Early in the DH season, these fish will be in pods after stocking has taken place. It is not unheard of to catch 10 even 20 fish from one large pod. These pods will slowly disappear as the fish move and spread out more. A week or so into the season, you will begin catching them in feeding lanes and other normal holding areas. A big rain event can help spread these fish out as well. There is no denying that freshly stocked trout will devour about anything, especially bright, flashy colored flies. Any junk flies like San Juan Worms, Squirmy Worms, Mop flies, colored eggs or Y2Ks will suffice for hook ups. Dries can be Stimulators, Caddis, Mayflies, and so on in sizes 10-14. Droppers (or nymphs) can be a Hares Ear, Pheasant Tail, Prince, and so on in sizes 14-16. DH fish do not mind chasing streamers or Wooly Buggers in sizes 8-12 that are stripped across current. Remember, these fish early in the season will just about strike at anything. Stockers don’t stay uneducated for too long as anglers begin pounding them. As the season rolls on, it may be necessary to remain more on the traditional smaller natural flies. If you are a first timer wanting to learn to fly fish, hook up with a guide that has been schooled in the art of fly fishing. Always check out a guide’s accolades and fly-fishing schools he has completed which will usually be in his bio. The best way to get time on the water and learn is from those of us who are professional full-time guides. If you are new to the area and do not know where to go, give us a call for info over the phone. If big water is intimidating to you or if the Toccoa River DH section is too rough for you to wade, we float the upper Toccoa with drift boats and rafts. Give Us a Call, We’ll Hook You Up! James Bradley is the only Orvis Endorsed Fly Fishing Guide in North Georgia’s Historic High-Country region. Reel Em In Guide Service has been offering their services to fly anglers since 2001. 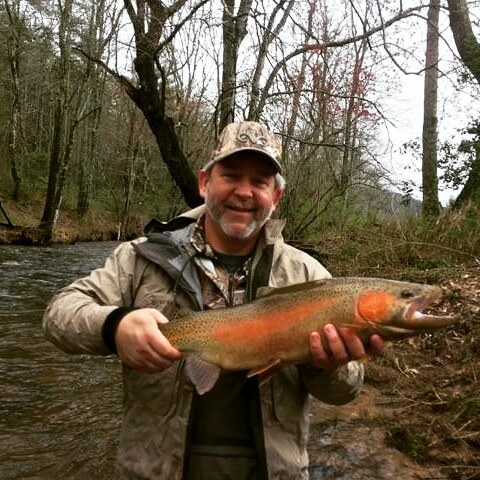 They have permits for guiding in North Georgia and North Carolina, offering over 7 miles of private trophy waters across Georgia, and operate drift boat trips on the Toccoa River in GA and the Tuckasegee River in NC.